The final match played on June 24, on Florence’s Patron Saint’s feast day for St. John the Baptist. The Calcio Storico Fiorentino is a combination of soccer, rugby and big time wrestling originated in 16th century Florence and played today in historical costume. The four teams of the historical neighborhoods of the city play against each other, first in two semi-finals and then the final match to determine the winner. 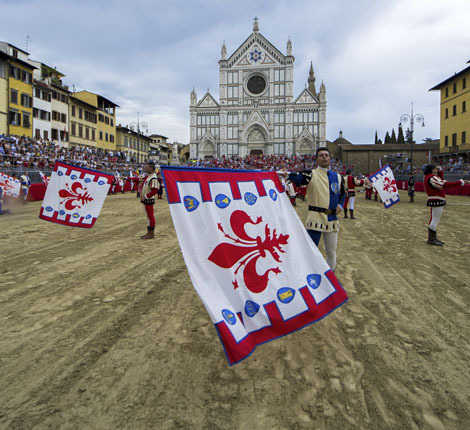 Piazza Santa Croce, located directly in front of the church Santa Croce, has always been the home to this game, known as “giuoco del calcio fiorentino” or more simply just as Calcio (which means “kick” in Italian). The square is covered in dirt to “return” to those times when it was just a dirt square (today it is covered in stone) and recreate the setting. Of course, today bleachers are also set up so that spectators can better enjoy the game. The official rules of the Calcio Storico were first published in 1580 by Giovanni de’ Bardi, a Florentine count. Invented by rich aristocreats, Calcio was originally just played by just the higher social class and took place every night between Epiphany and Lent. Just like Roman harpastum, it was played in teams of 27 and both feet and hands were used. Goals can be scored by throwing the ball over a designated spot on the perimeter of the field with another goal running the width of the short ends. There is a main referee, six linesmen and a field master. Each game is played out for 50 minutes with the winner being the team with the most points or “cacce” scored.